Winter is a great time to start birdwatching with your child. Because the weather is chilly and food is scarce, if you put one or more bird feeders outside a window you are almost certain to see at least one or two feathered friends pecking at them nearly any time of day, as opposed to in the springtime when the worms are plentiful and the birds have other things on their minds. 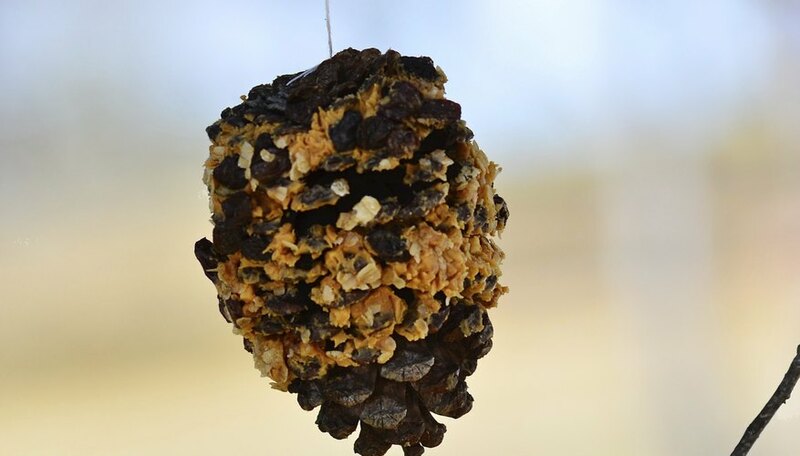 If you do not want to put up a traditional bird feeder but prefer a more natural model, then peanut butter pine cone bird feeders are the perfect solution. You and your child can make the bird feeders together, then hang them and watch the crowds fly in. Read on to learn how to make a peanut butter bird feeder. Cover a table in newspaper. This will protect the surface of the table from scratches and make cleaning up easier later. Tie a piece of string to the top of each pine cone. These strings should be at least 2 feet long so that the pine cones will hang far enough off the branches that squirrels cannot reach them. Spread a spatula of peanut butter onto the pine cone. Make sure that the peanut butter gets into the cracks and crannies of the pine cone so that it will not slide off outside. You should keep adding peanut butter until the entire pine cone is covered. Pour some bird seed into the plastic plate. It should cover the entire bottom of the plate. 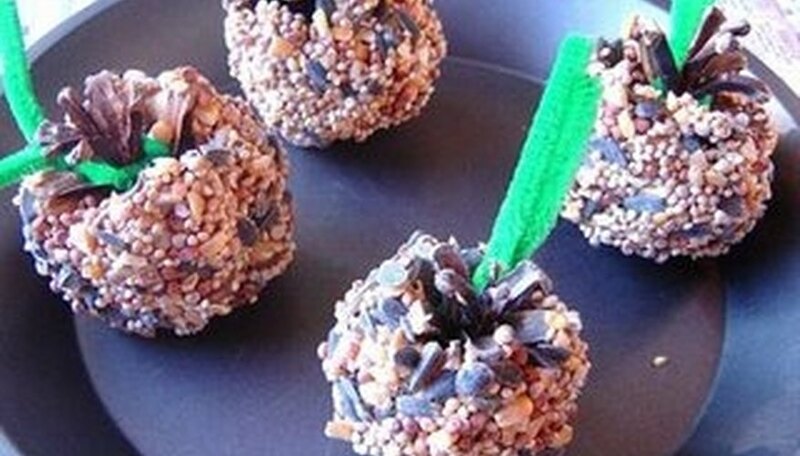 Roll the peanut butter pine cones in the birdseed. 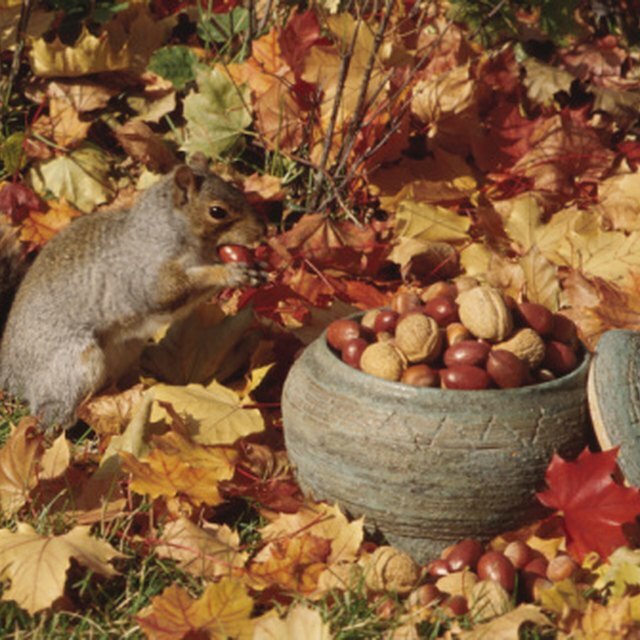 The seeds will stick to the peanut butter and create a tasty outer layer for the birds to eat. Hang the peanut butter bird feeders outside. You can hang them from the gutters of the house if you do not have trees in your yard, or on the balcony or from the window sill if you live in an apartment. You will not need binoculars to watch the birds because they will come right up to the window to eat the delicious treat that you made them. You can also stick bits of yarn to the peanut butter for the birds to use in their nests. Ellis, Carole. "How to Make a Peanut Butter Bird Feeder." Sciencing, https://sciencing.com/make-peanut-butter-bird-feeder-2352513.html. 24 April 2017.